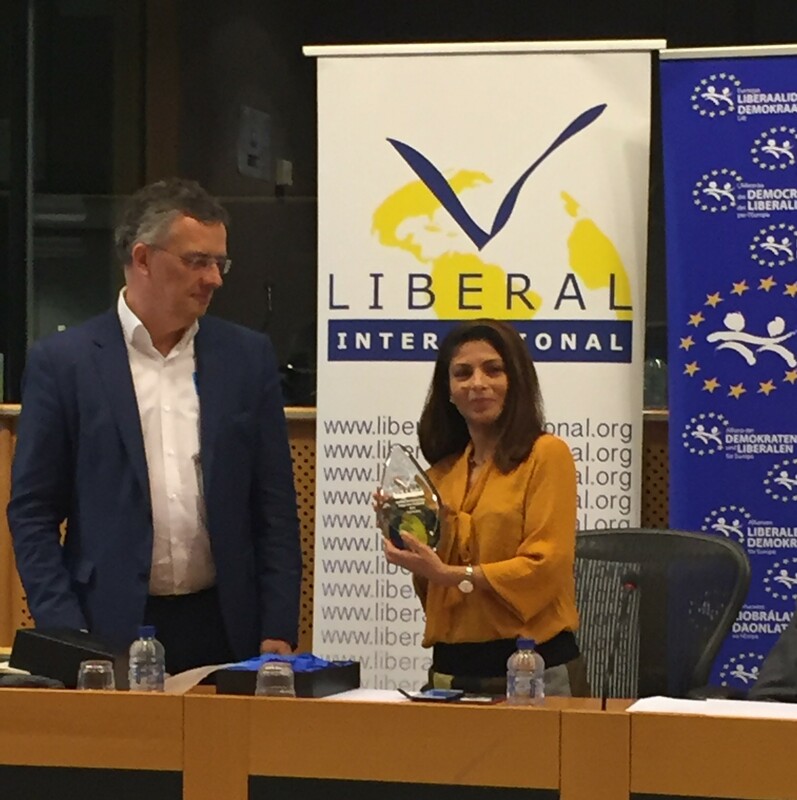 Ensaf Haldar, the wife of jailed Saudi liberal blogger Raif Badawi and President of the Raif Badawi Foundation, has been presented with the 2016 Liberal International Prize for Freedom on behalf of her husband at a special ceremony at the European Parliament in Brussels. Our President, Margaret de Vos van Steenwijk, and vice president, Khadija El Morabit, were both present on this occasion. 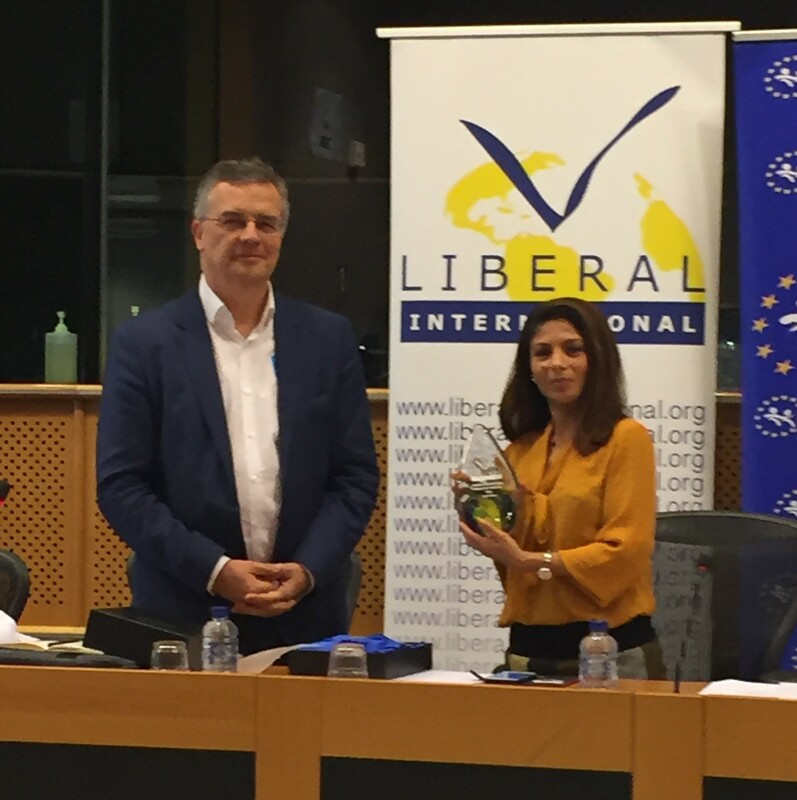 Awarding the Prize on behalf of Liberal International, Chair of LI Human Rights Committee and LI Vice-President Markus Loening, expressed gratitude for the work the Raif Badawi Foundation is doing, to give hope to others that individuals can stand up and make a difference. Mark Loening expressed that: “The prize is saying to “Raif” and to every freedom fighter in the MENA region, and to everyone who is dreaming of democratic change, that theirs is a legitimate human dream!”. “This Prize for Freedom goes to this courageous man who is imprisoned since 2012 and hasn’t seen his wife and children for a year now. His wife has found exile in Canada with her family of young children”. Moreover, Markus Loening expressed that part of the prize also goes to Ensaf Haldar herself. She is demanding attention for her husband’s cause all over the world and trying to get her husband free. Mrs. Ensaf Haidar said: “The fact that Raif Badawi has been awarded this esteemed prize is in itself a reminder of Raif’s own liberal message: the message of respect for the human being as an individual and his/her right to freedom and to live freely without fear or oppression: no matter the gender, religion, sect or ideology”. Raif Badawi was arrested in 2012 on a charge of insulting Islam through electronic channels and brought to court on several charges including apostasy. He was sentenced to seven years in prison and 600 lashes in 2013, then resentenced to 1.000 lashes and ten years in prison plus a fine in 2014. The lashes were to be carried out over 20 weeks. Previous recipients of the Liberal International Prize for Freedom include Aung San Suu Kyi (Burma/Myanmar), Benazir Bhutto(Pakistan), and Waris Dirie (Somalia).